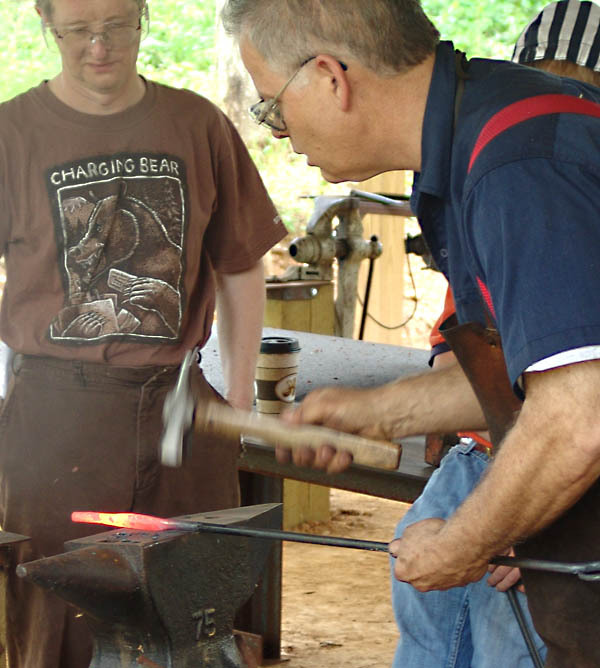 Located near the Blue Ridge Parkway in Floyd, Virginia, the Jacksonville Center for the Arts is home to Virginia’s first residential crafts school. Now in its second year of operation, it offers numerous opportunities to learn a new craft and to study with some of the best artisans in the region. There are so many high-value courses available that I plan to post frequently about upcoming courses and what makes them special. 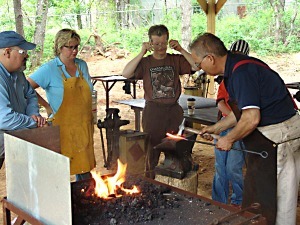 I recently wrote about the Learn to be a Blacksmith course and was fortunate to see the course in action today. If I had not had an appointment to keep, I could have stayed and watched for hours. 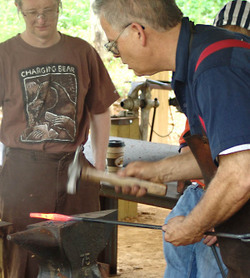 David Tucciarone makes blacksmithing accessible and understandable. Pulling red hot iron out of the forge, he deftly shapes it on an anvil with effortless strokes of his hammer while describing what he is doing and the things to watch out for. While his blacksmithing students watch attentively, he discusses the finer points of the hammer work necessary to achieve certain shapes. He is able to focus on what he is doing and share the experience with his students at the same time. I have seen blacksmiths at work before, but none who possessed the ability to explain the finer points of what they were doing while they were doing it. 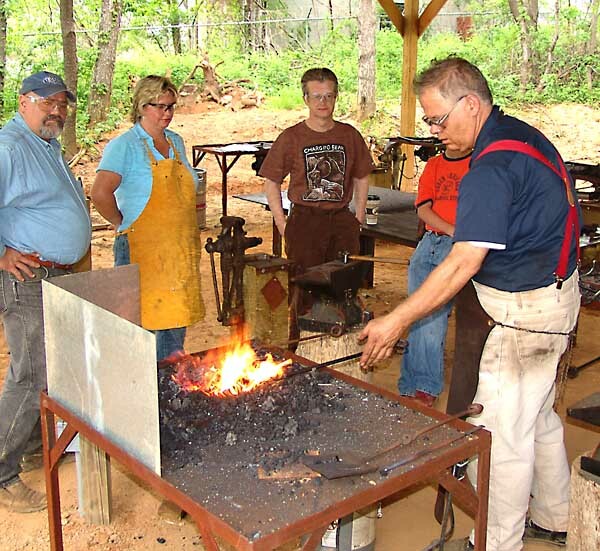 If you have any desire to acquire blacksmithing skills, you should check out the next course, Introduction to Blacksmithing, taught by Jessie Ward, a fourth-generation female blacksmith. It will be offered May 13, 20, & 27, Saturdays 9am-4:30am. Visit the Jacksonville Center website for more information. My son and I had a wonderful time at this class at the Jacksonville Center. David Tucciarone is a wonderful teacher. We learned how to make some cool things. While we were visiting Floyd (from DC), we had a great dinner at Oddfellahs Cantina, great coffee at Cafe del Sol and I loved staying at Rocky Knob Cabins.